In a way that’s a misnomer. 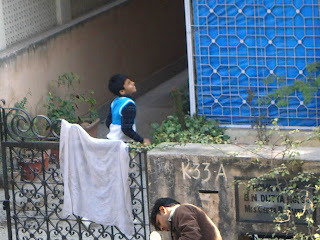 In Delhi, most backyard games are frontyard games. Like this one across the road. They’re playing for me, my camera and to reduce the static. 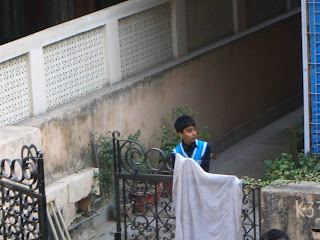 Now, I don’t know this kid or if he schools, but he plays more cricket than average kids his age. He even has in his employment an older boy to play with him. One he throws balls and tantrums at. Think this kid is a little like Greg Chappell was in his backyard. Ian will vouch for that. He’s looking for a voucher right now. Anyway one time this kid flung the bat, cheated, yelled, all in the course of a few balls. His employee walked out, SMG would’ve been proud. But the kid sweet talked him into playing again. He even feigned remorse, some Lacoste tears, and the general SreeSanth hamper. Soon they were playing again. I couldn’t care less. Then today, I started to care a little. The sun was good, and I was out, looking down on them, their lack of ethics etc. Then the camera forgave them. No need for Farooq Enginner. 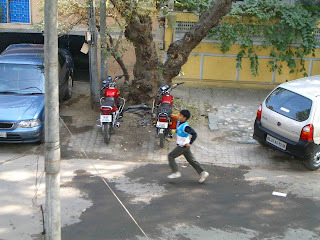 Some observations: the kid bats a few feet outside his wicket (that when their pitch is but a few feet). The kid bowls middle-leg stump line, short of length, knocking his employee’s nuts. Before bowling he tosses the ball up, and knocks it over the neighbour’s wall. He then runs to fetch it. 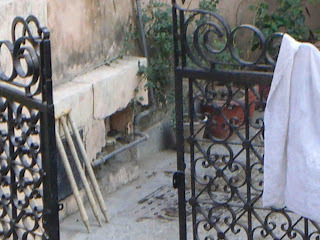 A stray dog looks on. He doesn’t know how to fetch it. The kid returns in all whites, SMG would have been proud. From a distance I cannot tell whether his sweater bears the BCCI crest. Bored Cricket Crazy Indians.com (BCC!) is at lunch. Be back. Excellent stuff. I enjoyed it immensely. Cricket is so much more than professional players strutting their talents and I always enjoy a window into the backyards from other parts of the cricketing world. I think you've inspired me to do a similar post about the kids who play on the beach outside my window every afternoon. Cheers. could be the beer but beach cricket's surreal - what with the sinking feet, aborted runups, howling ocean, splashy mermaids - u play on the beach? Even though I was not a good player of cricket; your front yard cricket reminded me of my childhood, when we too used to play in front of our flats. All of a sudden I wanted to be a child again. It's a sign of the profligate times that we live in, the recession be damned, that tycoon tykes need to employ people to play with( & I mean that in the strictly kosher sense)! This phenomenon can be witnessed in a variety of front & back lanes across Indian cities. What this fosters apart from split serf's nuts is cementing the lord/vassal relationship in the tyke's mind whilst foregoing the bonding between team members that we might have experienced during our tryst with cricket in the streets! Less like SMG & morelike Dhirubhai's progeny methinks! Reminded me of my younger days and gully cricket! AB, do you not still play? And about linking up with yr childhood, what abt yr cartoons? Q, u threw a lotta tantrums too? Bored Members, how about throwing in some gully crick memories for BCC! None at all NC, but I definitely coaxed a lot of neihborhood boys and men to throw some balls my way! Q, i always play on the premise that if you have a bat n ball, just ask, and somebody will turn up and turn his arm around. scorpi, trust you to cheat, from book cricket to cricket cricket. I think all of us could identify with the picture you portrayed, straight out of our childhood. Wish could return to those days. Som, you can. Takes a bat, a ball, and a wintery sunday afternoon. can arrange 2 out of 3.